This is an updated guide for the Low Life Righteous Fire Guardian build based originally on AHFACK build guide. The original guide was prior to 3.0 and was intended for Standard but with new Shaper and Elder items and Delve fossils the build has improved drastically for leagues. This build can do all the end-game bosses without much effort (AFK MODE!) and delves comfortably at 300+. This guide will explain what items to look for, how to craft them, and the best item possibilities. This is my first ever guide and the reason I am creating this is because the other variants of LLRF either are mana guardians or designed for standard. I have been playing and improving this build variant since bestiary league and every league has only made it better, so I thought I’d share! DISCLAMER:This build is not intended for league starting and can be very costly! I would estimate the starting cost to be at least 20 exalts and can easily climb to over 100+ Exalts. This guide is a work in progress and will be updated with more info/videos soon! This build can pretty much face tank all the game content with ease. When delving the hardest mod would be the elemental penetration but is doable. See videos of End Game Content. This build requires items from end game which do not become available until a week or so into the league. The item you want to acquire first is the elder hubris helmet with an enchant that reduces any of our aura reservations. This can be done by buying the helmet and using enchanting fossils, running lab, or just being patient for someone to post it for trade. Early in the league the jewels are pretty cheap since no one is running LLRF. The titanium shield for i86+ elder is pretty rare and could be expensive but you only need i80+ elder shield for +2 max fire res. What is the difference of this build compared to other RF builds? More Videos of Tankness Coming Soon! The only two REQUIRED unique items for this build are Presence of Chayula and Shavronne’s Wrappings. Really, the only required item is Shavronne’s Wrappings because of Chaos Damage Does Not Bypass Energy Shield but Chayula gives us Cannot Be Stunned, which is important when doing End Game content. The helmet is a key piece of the entire build. The helmet needs to be elder based ILVL 83+ ideally a Hubris Circlet. It needs to have the 20% reduced mana enchant for one of the following auras: Vitality, Purity of Fire, Purity of Ice or Purity of Lightning. It needs to have Essence of Horror and Burning/Concentrated Effect. Starting Helmet would be Essence of Horror with Concentrated Effect or Burning on it. This gives us a 6 linked Righteous Fire. Best Helmet would have Essence of Horror with Concentrated Effect and Burning Damage on it with high energy shield. Having the Burning Damage Suffix is much better than having the gem. The gem only gives up to 66% (21/23) but T3 suffix gives a minimum of 70% up to 89% with 20-35% of it being global (Added to SR). Level 21/22 Burning Damage Gem gives 66%. The shield is another key piece of the build. The shield needs to be Elder based ILVL 80+ and ideally Titanium Spirit Shield. You want +2 Maximum Fire Resistance with Highest Energy Shield possible. Starting shield can be simply +2 Maximum Fire Resistance with multi mod crafted. The belt is another key piece of the build. It gives a large amount of Energy Shield but more importantly increases our Energy Shield Recovery Rate, which increases all related recovery values including regeneration. The belt needs to be Shaper based ILVL 75+ and ideally Crystal Belt. You want T1 Energy Shield Recovery Rate, but should also have Increased Energy Shield or Resistances. Starting belt can simply be chain belt with T1 Recovery Rate and Some Flat ES or Maximum ES. Best belt would be Crystal Belt with T1 Recovery Rate, T1 Flat ES, T1 Maximum ES, and Delve Suffix Increased Energy Shield from Body Armour. The gloves should simply be maximum energy shield with resistances or dexterity. Ideally, you want Sorceress Gloves and Enchant Light when you take a critical strike. Although the Enchantment helps with damage, it may be better to get +2 Corruption to AOE/Aura skills with 21 Purities to get +1 Maximum Resistances. The rings are important because they can provide Damage, ES, Resistances, and Dexterity. One of your rings will need to be a Unset Ring with at least +2 to socketed gems for your Purity of Fire. If you have +2 then you will need Level 21 Purity of Fire, +3 works with Level 20. You can replace this if you have a corrupted Presence of Chayula with Level 23 Purity of Fire. The other ring should be crafted with Dense Fossils to get the Delve Suffix Increased Energy Shield from Body Armour. Ideally, you want to use Opal Ring for the 25% Elemental Damage boost. Getting the delve suffix with flat T1 ES and Intellect is the biggest boost to Energy Shield but you should prioritize getting stats and resistances. The weapon simply provides us with increased damage. I personally use Dreadbeak, which provides 100% damage, onslaught, and attack speed for shield charging. Another great option is Doryani's Catalyst, which can provide a little more damage than Dreadbeak. The best in slot item would be a Rare Void Sceptre, which can give over 170%+ Damage. There are a few options here depending on your Dexterity and Stats. Personally, I use Sin Trek because it provides Dexterity, Intellect, Movement Speed, and High Energy Shield. You can also use Death’s Door for the bleeding. Crafted Sorceress Boots would also be great if you can fill in the dexterity elsewhere. The jewels are a huge part of the build because they provide Maximum Energy Shield and Damage. Ideally you want Maximum Energy Shield with Burning Damage and Fire Damage. You can substitute Burning Damage with: Area Damage, Damage Over Time, or Increased Damage. Fourth Stats should be more damage, resistances, or Dexterity/Intellect. Energy from Within - provides a big boost to Energy Shield. Watcher Eye – This is very important because it provides a huge boost to Regeneration. You want Discipline % ES Regeneration or Increased ES Recovery Rate. Best in slot would be % ES Regeneration, ES Recovery Rate. And if you are lucky/rich the 3rd stat would be Clarity Increased Max ES % based on Mana. You want to start out with a Hubris Circlet that is ILVL 82+ and ELDER BASE. Recommended to have 30%+ Quality. Recommended to have one of the Reduced Aura Enchants. You want either Burning Damage or Concentrated Effect. Concentrated Effect is good but you cannot Master Craft, meaning you are stuck with what you get. Burning Damage is much better because it allows you to swap AOE and CONC gems and if you have an open prefix you can Master Craft. Master Crafting you will wipe the prefixes and try to hit High Energy Shield or Concentrated Effect. You want to start out with a Titanium Spirit Shield that is ILVL+ 80 and ELDER BASE. Recommended to have 30% Quality. Recommended to have ILVL 86 for T1 ES %. The quickest and cheapest way to obtain a decent shield is to use Alterations. You will need Alteration, Regal, Scour, and Annulment Orbs. The goal is to roll +2 maximum fire resistance, hopefully without a suffix. However, if it does have a suffix, then you should judge whether it will be worth using a regal and annulment orbs on. I personally skip any bad suffix mod and only use augment orbs on high resistance suffixes. So, to craft you will start using alterations on the shield. Do not waste augments on suffixes that are bad. Simply spam alterations until you get +2 maximum fire resistance. This may take a few hundred alterations before even seeing it. Once you get it, then you must decide if you want to regal and try to annul the mods off. The result will give you a 200-300 ES Shield which is good for starting out. The other option for crafting is to use Fossils from Delve. You will need to use Dense + Scorched. This can be very expensive and time consuming but is the only way to get the best possible shield. You want to start out with Sorceress Gloves that are ILVL 84+. You are simply going to use Dense Fossils until you hit something viable. This can take a lot of attempts before getting something. You ideally want Triple T1 Prefixes with the Delve Suffix and an open suffix. You want to start out with Crystal Belt that is ILVL+ 75 and SHAPER BASED. You will use Dense Fossils. You can also use Dense + Scorching to get the Increased Fire Damage suffix (20-30%). There are not a lot of mods to compete with but getting all 4 mods that are T1 can become costly. You can easily craft a decent belt pretty quickly using just Dense Fossils. If you have an open prefix and can't craft anything good then craft increased damage. If you have an open suffix and do not need res or attributes then get the life regeneration during flask. You want to start out with a Opal Ring that is ILVL+ 84. You are looking for ES From Body Armour and Increased ES. The other mods should be either Resistances or Stats depending on what you need. You could use Dense + Prismatic in attempt to get the Increased Elemental Damage Suffix but will make getting the ES mods more difficult and can become costly. Using an SHAPED Opal Ring that is ILVL 80+ can allow you to hit the Cold Damage to Spells/Attacks which helps with Elemental Equilibrium but is not necessary. If you have an open prefix you could craft either increased damage or faster start of energy shield recharge. You want to start out with a Void Sceptre that is ILVL+ 84. You will use Prismatic Fossils. You could add Aetheric Fossils to help reduce attack mods. You could add Scorched Fossils to increase fire/burning mods. If you roll with 2 prefixes/3 suffixes then you could try to annul. If you have just the prefix and 2 suffixes then you will need to annul another suffix. This will prevent the item turning Magical but costs 4 exalts to clear then another 2 exalts to multimod again. The crafted Sceptre will have a range of 138% to 170% Fire Damage, 20-30% DOT, and an open suffix for Stats/Res. I DO NOT recommend leveling as righteous fire! The past leagues I usually level as sunder/arc totems then respec when I get level 80. The build will not feel good until low level 90s and each point after 90 is pretty powerful. Hope you continue working on this. I would consider a double 35% aura blood magic setup and drop that clarity. With that you basically woudnt need the enchantment as far as im aware, right ? Nice to see a league-focused update to the classic AHFACK guide. Keen to read the "What is the difference of this build compared to other RF builds?" section when it's done! You've also mentioned elsewhere running Aspect of the Spider over Vitality when mapping - how much of a difference does it make? 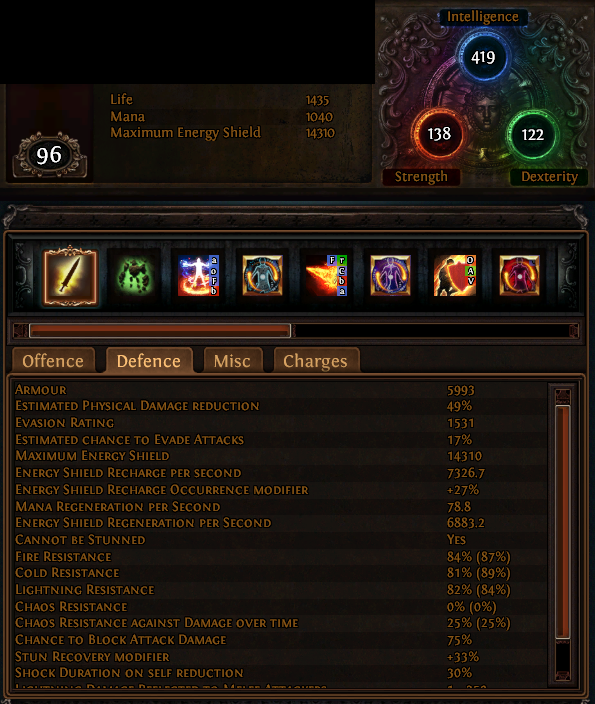 Have you experimented with using Storm Brand over Orb of Storms to proc EO/EE? Correct, you can switch the auras around if you do not have the enchantment. The reason we use Discipline with blood magic is so that we can link it with Empower which gives us 500+ ES boost. Clarity helps us sustain casting scorching ray without interruptions. Linking the purities to blood magic would require level 4 enlighten and would free up 20%+ mana reservation which could be used for Clarity/Aspects. The differences are pretty much expected.. but I will do a comparison of numbers focusing on Damage/Regeneration/Resistances and update soon. Summary: This build is highest DPS, Jugg is Tankiest but lowest DPS, and the guardians are less regeneration/damage but higher maximum ES and physical reduction. Running aspect of the spider over vitality can feel a little dangerous at times since it drops over 35% of our regeneration and is only possible if you do not use the vitality watcher's eye. I switched back to vitality whenever I was doing bosses or syndicates. I did mess with Storm Brand a little bit and did not like it very much but it proced EO fine and if you do not mind casting it, it works just as good as orb of storms. Keep ur content up.This build looks promising +1 rep guide.Probably my next league boss killer build :D.
How will this look after the changes to ES? Leech does not affect it I think, I need to scout the tree for regen changes. I hope you keep it updated OP! 3.6 Update - Killed Uber Elder Deathless at level 93. Took about 2 weeks to gather all the gear. Elder Hubris helmets with any enchants seem to be very rare and spending 100+ enchanted fossils only got me one usable enchant! Synthesis has introduced a lot of really good implicit values on items. Shields, gloves, and boots can all get Maximum Resistance but it appears to be very rare. I managed to get a shield for a lot of currency but it's worth it! Getting high energy shield is much easier with the implicit for flat energy but again can be very expensive. Overall, I think I spent over 75+ exalts on all my gear.. Note: The POB shows lower Energy Shield values, my actual ES is 14.368. I think this has to be something with the ES from Body Armour not being calculated correctly. Is Prism guardian shield simply not good enough?